What makes the same hymn inspire one individual to heroism and lead another to boredom cannot be calculated. It has to do with the mysterious way in which song connects us to our past, our soul, our future, our Savior. And because God intended us to be different, our uniqueness is caught up and reflected in our response to the music of the church. Music is the heart of the school [Eastern Mennonite]. It revives our spirits when they are at a low ebb. It puts hope into our hearts when worry would invade them. It unites us in purpose. Every chorus practice means relaxation from classes. We forget ourselves, our work, and our grades, as we listen for harmony and beauty. In contrast to singing wafting through campus from morn to night 70 or 80 years ago, EMU students in 2011 will, or can, partake of almost any type of music – if not every day, then at some point during the week. Jazz ensembles, orchestral performances, auditioned and open choirs, individual training in keyboard, stringed, wind and percussion instruments, as well as vocals. Gospel, rock and folk groups. And, yes, a cappella singing. An EMU student can aim to be a performer, conductor, music educator, minister of music, or combination of these. He or she can do music as a wonderful way of praying and worshiping God, or purely out of love for it, or because making music is a way of balancing out one’s life as a student or as (say) a future scientist, business person, or full-time parent. 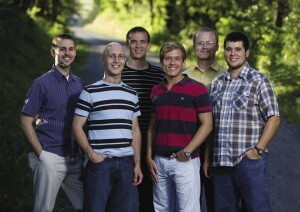 After graduation, many former students join other alumni in forming ongoing groups, like the six-member men’s a cappella group Sons of the Day and the eight-member women’s a cappella group Shekinah. 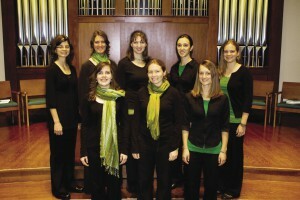 Based in Harrisonburg, both groups are eight years old and composed mainly of alumni. Cantore in Harrisonburg consists of 10 men, seven being alumni from the ’80s or earlier. Daphna Creek in the Broadway area of the Valley had four alumni as core members (and three alumni who rotated in) when it performed Christian-themed folk music from 2001 to 2009. More recently, we’ve seen alumni forming folk or “Indie” music groups, such as Trent Wagler & the Steel Wheels (named “Best in the Valley” by the Daily News Record in 2010), Dear Wolfgang, Mild Winter, and Preacher. Many music majors become private instructors, as Faye G. Yoder ’68 did upon graduating as EMU’s first piano major, or they become schoolteachers. (More on this topic later). M.T. 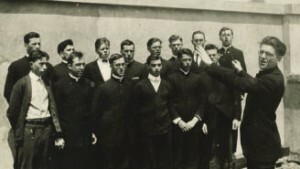 Brackbill directs the men’s chorus in 1925. Today’s rich diversity in music would have stunned the founders of this university. In 1913, the first constitution for what became Eastern Mennonite College (EMC) specified that only vocal music was to be taught and that no instruments were to be permitted. As odd as this proscription may sound to 21st century ears, the founders of EMC were not being arbitrary. They saw unaccompanied congregational singing as essential to staying true to the Mennonite form of worship. Stauffer noted that beginning under Emperor Constantine in the 4th century, Christians spent about 13 centuries unable to have a full voice in their churches. Instead of participating in congregational singing, they were expected to listen to trained choirs singing in a language they didn’t understand (Latin) and to obey clergy chosen without their consent. The Anabaptist movement that gave rise to Mennonite churches was filled with people who wished to worship God in the manner of their own choosing, with no intermediaries. Singing hymns themselves—with understandable words that came from their hearts or directly from the Bible—was one of the worship choices they wished to make. As participants in a small religious movement that did not conform to the dominant Catholic and Protestant churches of their day, Mennonites were persecuted almost everywhere they lived in Europe and Prussia. When imprisoned, many early Mennonites wrote new devotional words for the popular tunes of the day. They sang these songs in their final hours and moments before being executed in torturous ways. 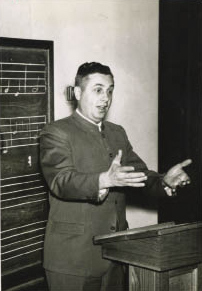 Earl M. Maust taught music from 1948 until his death in 1969. The Vespers Chorus, pictured in the 1956 Shen. Stauffer played a pivotal role in the college’s music program from his arrival as a faculty member in 1939 through the 1960s. Alumni from his era appear unanimous in praising him for the choral leadership and training he offered. Every year, for instance, Stauffer gathered hundreds of singers to rehearse and perform the “The Holy City,” an oratorio, and “David the Shepherd Boy,” a light Sunday school cantata evocative of a Gilbert and Sullivan musical. These events began being held in the early 1920s and continued after Stauffer’s time, through the 1970s. “When I came to EMC in 1956,” John L. Horst Jr. ’60 told Crossroads recently, ““the Holy City was done annually at homecoming in the spring of the year. The large Collegiate Chorus rehearsed it extensively and alumni would join us for a two-hour Saturday morning rehearsal, followed by a packed Lehman Auditorium performance on Saturday night.” Horst is a retired EMU physics professor. 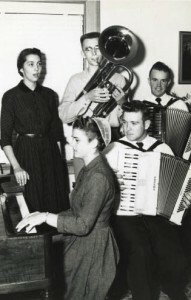 In the 1950s, instruments had to be played off campus, in homes. As pictured in the 1955 Shen: Alma Trumbo, Miriam Pellman, Gerald Bender, Lee Hartzler, Amsey Martin. The last 50 years have proven Stauffer to be both right and wrong. Right, in insisting on the necessity of quality musical instruction. But Stauffer appears mistaken in thinking that other forms of music inevitably lead to less devotion to God. Park View Mennonite Church, a church physically near EMU that is heavily populated by EMU-linked congregants, has managed to retain the strength and beauty of its congregational four-part singing while adding regular organ and piano playing, along with periodic chamber and folk musicians, gospel choirs, percussionists, and songs from other traditions sung in unison or even chanted. 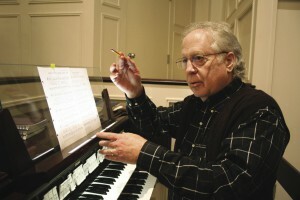 Long-time EMU music professor Kenneth J. Nafziger, a member of Park View, says ideally a church should weave its music into the liturgy, ritual and message of the entire service, so that the worship experience is just that: an all-embracing experience, supported and elevated by various forms of musical expression. Usually led by music director Judy Bomberger ’73 or choir director Karen Moshier-Shenk ’73, some of the singing at Park View is a cappella, but much is not. Park View does not sponsor ““singing schools” for its newcomers and musically challenged members, as some Mennonite churches did a century ago. Nevertheless most of its congregants clearly know how to sing, as exemplified by their periodic unrehearsed singing of portions of Handel’s Messiah. With dozens of EMU-trained singers and musicians, Park View offers a vibrant answer to Stauffer’s mid-century concerns about the future of Mennonite worship music. The a cappella multi-part harmony singing associated with Mennonites is actually not that old. The tradition dates to the mid-1800s among Mennonites in Russia and to the late 1800s in the United States. 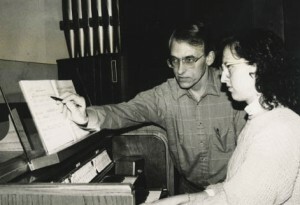 John Fast, teacher of organ, piano and music theory since arriving in 1975 (our longest-serving music prof), with Sandy Waltner in 1993. Seeking a better life and religious freedom, Mennonites in Prussia moved to Russia in the 1700s. They took with them the tunes of Lutheran hymns, to which they put their own words. They apparently sang these hymns in unison for several generations, but by the late 1800s, some in their communities realized the singing was becoming abysmal. Such changes were resisted by many, which explains why the Amish and some Old Order Mennonites sing in unison to this day. In their eyes, four-part singing fosters individualism and pride instead of humble obedience to God. 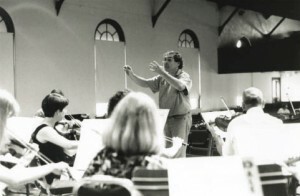 Ken J. Nafziger conducting a rehearsal in the mid 1990's. Both the General Conference (GC) Mennonites and the Mennonite Church (MC) Mennonites eventually founded colleges, with the GC group leading the way with the establishment of Bethel College in Kansas in 1887. The MC group then founded Goshen College in northern Indiana in 1894 and Bluffton University (initially named Central Mennonite College) in Ohio in 1899. 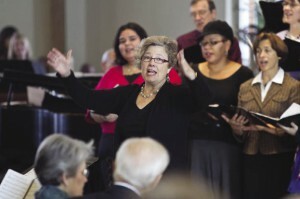 Judy Keener Bomberger ’73, music director at Park View Mennonite Church. 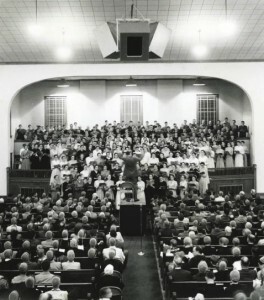 With Mennonites avoiding instrumental music until the 1900s, there was much space and energy for developing the voice and for congregational singing. Joseph S. Funk (1778-1862) stepped into this space. The Virginia Mennonite Conference appointed Funk to the three-man committee that published the first Mennonite hymnal in English. First printed in Winchester, Virginia, in 1847, the 364-page hymnal was reprinted on the Funk-owned press in Singers Glen near Harrisonburg in 1851, 1855, 1859, 1868, and 1872 (as well as reprinted elsewhere in other years). Karen Moshier-Shenk ’73, choir director at Park View Mennonite Church. She and Judy Bomberger '73 (facing page) also sing in "Finely Tuned," a women's a cappella group with Elaine Hunsecker Dunaway '89 and L. Elaine Warfel Stauffer '73. By 1890, four-part singing was sufficiently accepted by North American Mennonites that they furnished each hymn of their hymnals with a four-part harmony, making the use of a separate choralbook superfluous. Beginning in the late 1800s, Mennonites organized and attended singing schools, though generally it was not acceptable for these schools to be housed in churches. 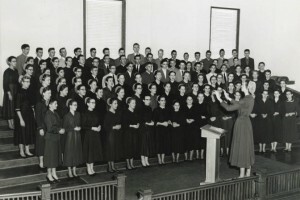 By the 1950s, singing schools had fallen by the wayside, probably due to competition from other entertainment outlets and due to opportunities to learn singing at Mennonite-sponsored schools and colleges. In 1913, Bluffton became the first Mennonite college to select an a cappella choir and dispatch it into the community and on tour for performances. Over the next several decades all Mennonite colleges began doing the same – a distinct change from the 19th century view that sacred music was not a spectator activity for Mennonites, but only a participatory one as part of communal worship. Glenn Lehman ’66, founder and director of Harmonies Workshop, 1987 to present. Also organist at Neffsville Mennonite Church In Lancaster. Author of You Can Lead Singing. Has two master's, one from Westminster Choir College. A final reason for Mennonite colleges to embrace change in the way they approached music stemmed from gaining accreditation to train music teachers destined for public institutions. To do this work, Mennonite colleges needed to provide a well-rounded music education that included competency in musical instruments, regardless of historical and theological reasons for downplaying instruments and emphasizing the voice. Today, EMU-trained music teachers – such as Michael W. Miller ’82 of Boonsboro, Maryland, who teaches music to elementary-aged students ; Bethany Blouse ’06, who is choral director at Stuarts Draft (Va.) High School ; and Janet Heatwole Hostetter ’87, choir director and pianist at Wilbur S. Pence Middle School in Dayton, Virginia  – are feeding the spirits of hundreds with their passionate musical service and leadership in public school systems. Carroll J. Lehman ’64 teaches voice and opera at Keene State College (5,400 students) in New Hampshire. He holds master’s and doctor’s degrees in vocal performance from the University of Iowa. He has been on the faculty of Hope College, Holland, Michigan, and Western Washington University. As a bass-baritone, he has performed more than 20 principal roles in opera. He judges vocal competitions up through the national level. Ronald Lyndaker ’78 is academic director of Lewis & Clark College in France, a consortial study abroad program. He is also an administrator and a humanities professor at the trilingual undergraduate program of the Institut d’Études Politics in Nancy, a branch of the highly selective “Sciences Po” of Paris. Finally, he is a tenor in the permanent chorus of the Opéra National de Lorraine. Lyndaker did a double major at EMU – modern languages and music – followed by graduate work at Ohio University and University of Texas at Austin, where he earned a doctor of musical arts degree. Karen Fix Rice ’95 teaches piano and sings at Winston Salem State University (6,000 students) in North Carolina, a public institution that was historically black. In 2009, she completed a doctorate in musical arts (piano) at the University of North Carolina at Greensboro. She has taught at four North Carolina universities. She recently performed at the College Music Society’s national conference in Quebec City. SONS OF THE DAY: Nathan May, Matthew Hunsberger '02, Joel Ross, Michael V. Heatwole '09, W. Clay Showalter '02, Chris A. Burkholder '08. In 2002, the two main traditions among modern Mennonites in the United States – the General Conference and Mennonite Church groups – officially merged, reflecting their increasing similarities and, some would say, their increasing assimilation into mainstream US society. The majority of Mennonites no longer live on farms, and they no longer spend as much of Sunday and Wednesday evenings in their churches, singing and otherwise worshiping as a group. Less than half of those enrolled at the six Mennonite institutions of higher education identify themselves as being Mennonite, reducing the pool of those trained in congregational singing. Newer Mennonite churches consisting of recent converts, often in urban areas and serving ethnic or minority constituencies, tend not to sing in four-part harmony or to seek ways to learn the skill. There are even those church leaders (a minority, so far) who assert that any amount of sight-reading music and four-part harmonizing makes newcomers feel uncomfortable and thus should be avoided. “Contemporary-style” services generally feature songs sung in unison, often with words (but not musical notes) projected on a large screen in the front, with instrumental or recorded music carrying the singing. SHEKINAH: (Back, l-r) Aubrey Helmuth Miller, Sharon Kniss '06, Joanna Souder Showalter ‘04, Greta Shenk '10, Sara Hershberger Gingerich '07. (Front) Jessica Hostetler '08, Jenny Hartwig Wagner '06, Sylvia Hooley Meyer '09. 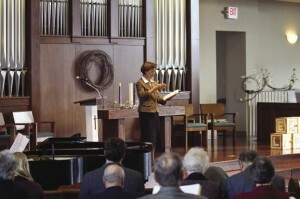 A 2003 survey of 104 Mennonite congregations shows that they continued to do four-part harmony “more than anything else,”  but the time devoted to it is giving way to other forms of music, including singing international worship songs in unison, listening to select choirs, and being accompanied by various forms of instrumental music. Is this an enrichment of the Mennonite choral tradition, or an erosion of it? Janet Heatwole Hostetter ’87, choir director, Wilbur S. Pence Middle School, Dayton, Va. Continuing to sing, and teaching the next generation to sing, regardless of the quality of anyone’s voice, an impulse which goes against today’s drive for “professionalism” and perfectionism in most walks of life. Possibly reinstating a modern version of “singing schools,” or at least offering optional (and fun) practice sessions, for newcomers to the tradition. Retaining a core group of songs that people are able to sing from memory for critical moments in their lives, such as singing to calm oneself during a scary situation or singing as a family at the bedside of a dying loved one. Considering whether instrumental music and technology might accidentally usher in theological changes. When amplified music overwhelms the singing, does this render the congregation more passive, with less “voice”? Roth, Daniel Roy. “A Curriculum for a Proposed Church Music Major at Eastern Mennonite College,” his master’s thesis at U. of Oregon. September 1972. Source of this quote and following two paragraphs. It and other materials referenced in this article can all be found in EMU’s library system. Stauffer, Mark J. Mennonite Church Music—Its Theory and Practic, a 46-page booklet. Mennonite Publishing House, 1947. All Stauffer quotes herein come from this booklet. J. Mark Stauffer surely would like the excellence of the music instruction offered at EMU today, where faculty, staff and advanced students cater to all skill levels and ages with well-subscribed programs. The programs are overseen by musicians with graduate degrees, usually doctorates. In addition to their academic credentials, they have been hired for their ability to both make and teach music beautifully. a rare combination. Go to http://www.youtube.com/watch?v=XRwpcTTfYb0 to view Karen Moshier-Shenk leading the Park View congregation in the singing of the “Hallelujah Chorus” from Handel’s Messiah during their Easter worship service on April 4, 2010. The organist is EMU music professor John Fast. Reimer, Margaret Loewen. “Mennonites & Music. Footnotes on the way to four-part harmony.” The Christian Leader, Nov. 1995, p. 13. Maust, Earl M. “The History and Development of Music in Mennonite-Controlled Liberal Arts Colleges in the United States.” Doctoral dissertation, School of Music of the George Peabody College for Teachers. August 1968, pp. 80 & 98. Pellman, Hubert R, Eastern Mennonite College, 1917-1967—A History. EMC, 1967, p. 240. Shearon, Stephen. “Funk, Joseph.” Encyclopedia of American Gospel Music. Ed. W.K. McNeil. Routledge, 2005. p. 134. Michael W. Miller ’82 was a voice major at EMU, who also played trumpet. He has since learned to play the baritone, violin, cello, clarinet, saxophone and flute sufficiently to teach these to children in his school band. In his 7th year as a teacher in 2010-11, he is working on a master’s in educational leadership. at Hood College in Frederick, Maryland. As an undergraduate, Bethany Blouse ’06 toured with the Chamber Singers, had a role in a musical (Music Man), took three opera scenes classes, and frequently performed in EMU’s noon recitals. 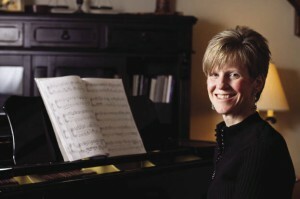 Janet Heatwole Hostetter ’87, former director of music ministries at Harrisonburg Mennonite Church, has a master’s degree in choral conducting from James Madison University. Jacoby, Stephen. “What Are Mennonites Singing in Sunday Morning Worship?” Sound in the Land – Essays on Mennonites and Music. Eds. Maureen Epp and Carol Ann Weaver. Pandora Press, 2005, p. 186. Kropf, Marlene and Kenneth Nafziger. Singing, A Mennonite Voice. Herald Press, 2001, pp. 160-161. Harder, Gary. “Congregational Singing as a Pastor Sees It.“ Music in Worship – a Mennonite Perspective. Ed. Bernie Neufeld. Herald Press, 1998, p. 109. Kreider, J. Evan. “Silencing the Voice of the People: Effects of Changing Sanctuary Design.” Music in Worship – a Mennonite Perspective. Ed. Bernie Neufeld. Herald Press, 1998, pp. 212-225. Nafziger, Kenneth. “And What Shall We Do with the Choir?” Music in Worship – a Mennonite Perspective. Ed. Bernie Neufeld. Herald Press, 1998, p. 193. Kroft & Nafziger, p. 163.